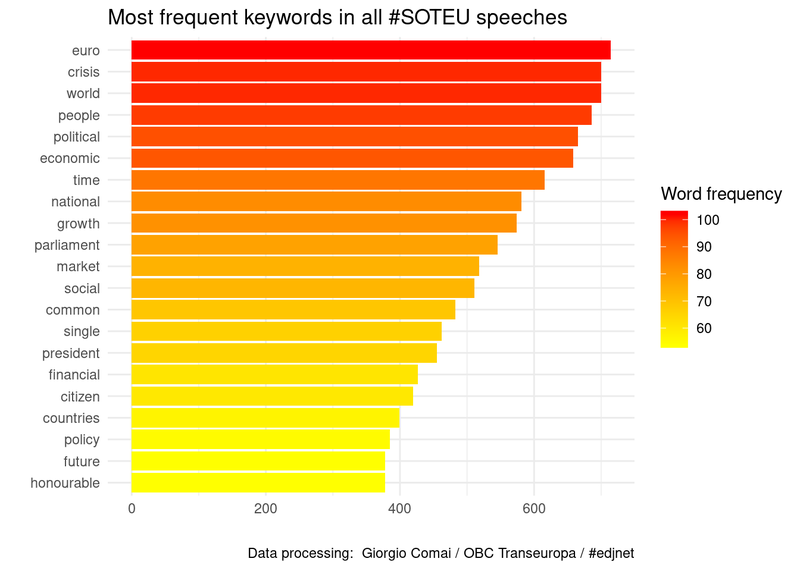 This post offers different examples of data visualisation aimed at exploring “State of the Union” speeches since they have first been introduced in 2010 (the speech was not delivered in 2014 because of European Parliament elections). It highlights key steps in the procedure, and includes the actual code in the R programming language used to create them (hidden by default). The source document can be downloaded from GitHub. In order to process them as data, it is necessary to extract first the relevant sections of the webpage. The same could effectively be accomplished by copy/pasting the transcripts. In order to analyse texts, it is common to stem words to ensure that “example” and “examples” are counted as one and the same word. 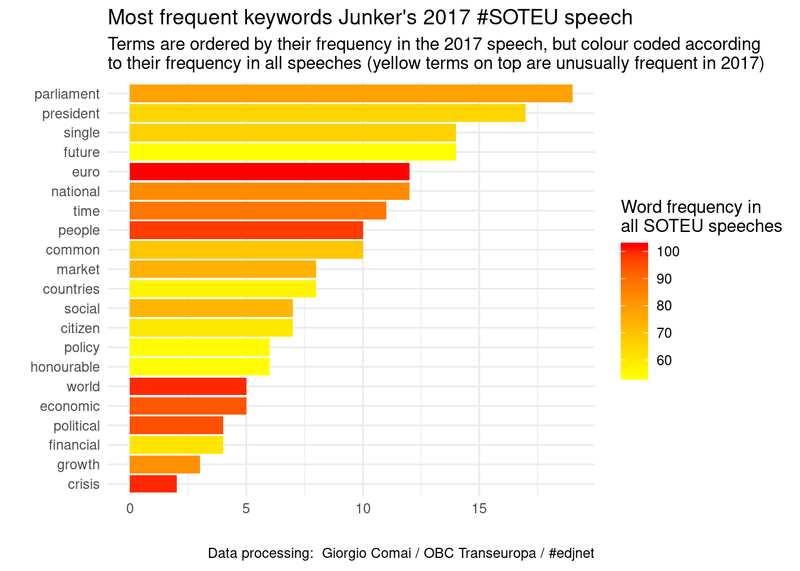 Rather than stemming all words (which would make some of them unclear in the graphs that follow), only selected keywords are stemmed (e.g. ‘citizens’ is transformed to ‘citizen’, and ‘refugees’ is transformed to ‘refugee’). 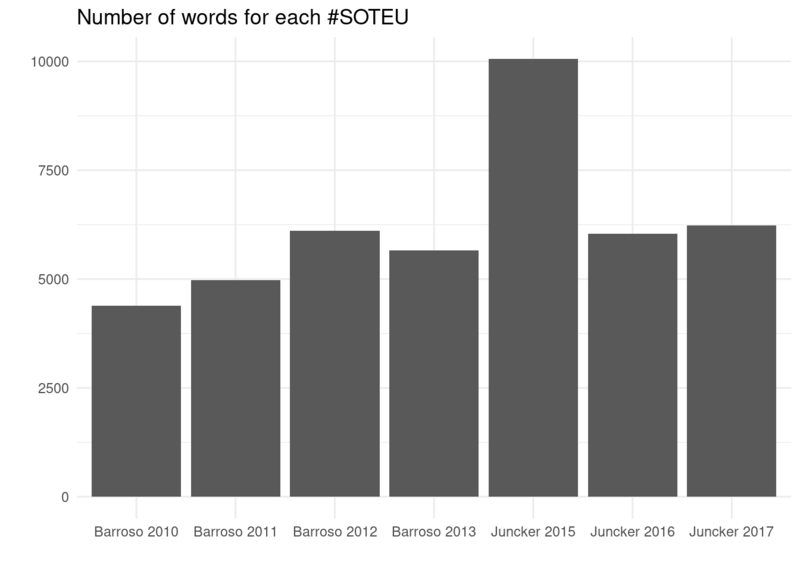 Self-referential words such as ‘european’, ‘commission’, ‘union’, and ‘eu’ are excluded from the following graphs: they are found much more frequently than all others and would effectively obscure more interesting results. Stopwords such as ‘and’, ‘also’, and ‘or’ are also excluded. 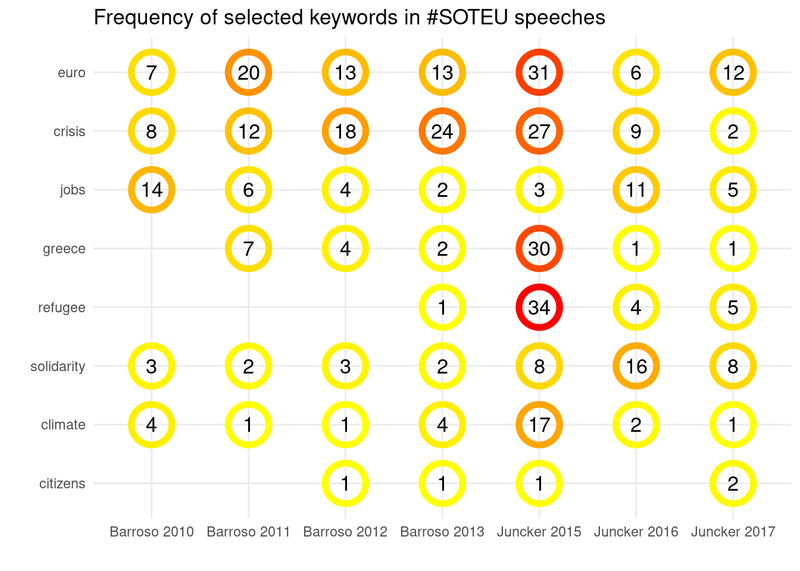 What are the most distinctive words of each SOTEU speech? 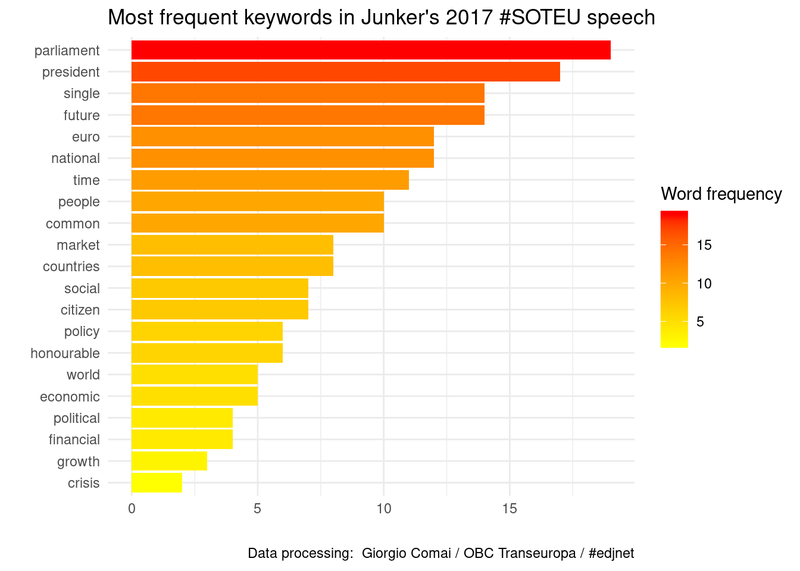 Looking at these wordlcouds, it quickly appears that ‘crisis’ is the dominant negative words in each of the speeches, but the positive counterpoint is different every year. This wordcloud is based on all words included in the same sentence as a given keyword (in this case, crisis). This document, the graphs, and the code are distributed under a Creative Commons license (BY). 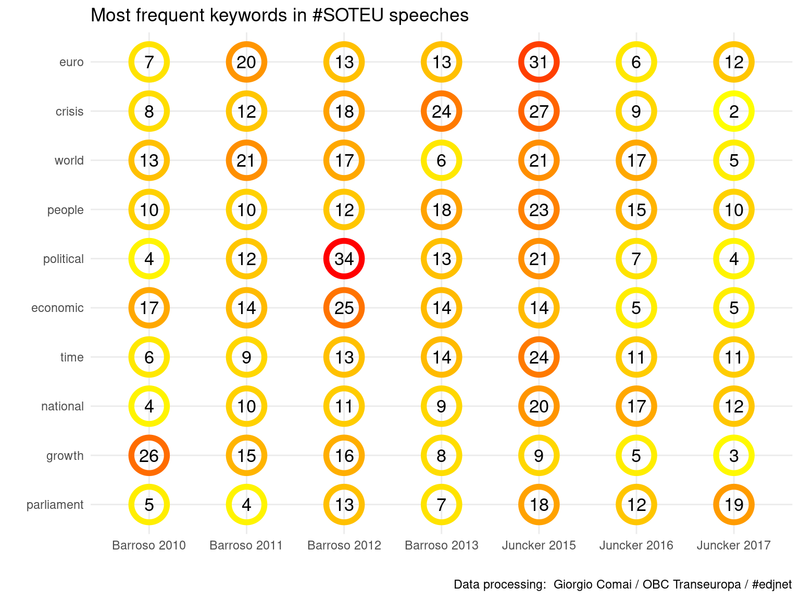 In brief, you can use and adapt all of the above as long you acknowledge the source: Giorgio Comai/OBC Transeuropa/#edjnet - https://datavis.europeandatajournalism.eu/obct/soteu/. Giorgio Comai is on Twitter giocomai. His website is https://giorgiocomai.eu/. OBC Transeuropa is on Twitter @BalkansCaucasus / on Twitter @BalcaniCaucaso - https://www.balcanicaucaso.org/.